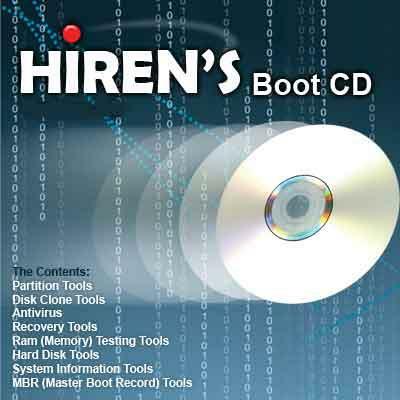 Hiren’s BootCD is probably one of the most useful tools for tech support when it comes to removing malware, viruses, rootkits, or even repairing damaged partition tables. First, you can download the BootCD from here. Make sure you download the latest version (which is 15.2 as of this article). You’ll be downloading a zip file, so when its finished, just extract it because we’ll be using the ISO image out of it. You can save it to your desktop or anywhere you’ll remember. Next, you’ll download a handy little tool called Rufus, which you can get from here. This program lets you create a bootable USB stick a number of ways. Once you have everything downloaded and the ISO extracted, run the Rufus exe and it’ll open a window like that above. 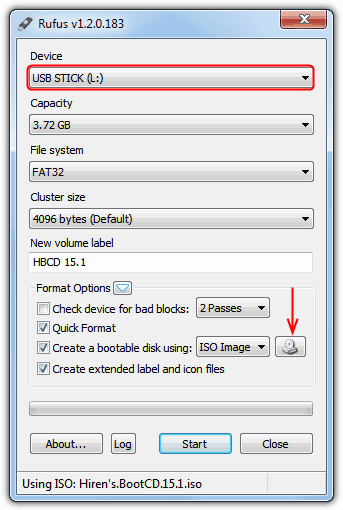 Select the options above and browse to your ISO file. *NOTE: This process will erase everything you have on your USB drive. Once you’re ready to go, press the start button and wait for it to finish. When booting to a USB drive, you have to make sure your BIOS has the option to boot to one. Most newer computers do, but some older ones might have problems with it, in which case it might be best to make the BootCD. Another good thing about doing it on a USB stick is that its just as easy to update the files when a new version comes out. You don’t have to re-burn a CD, you can just download the new version and extract the HBCD folder from the ISO and copy it onto the USB stick.